Agriturismo La Selva, located at 5 kms only from Siena and completely surrounded by the green rolling hills typical of this area of Tuscany, offers rooms and apartments for a vacation dedicated to the discovery of Siena, Val d'Orcia and Chianti areas. At guests' disposal, a wonderful panoramic swimming pool looking onto the green landscape and immersed in a huge 38 hectars park. The equestrian center deserves to be pointed out, since it's runned by professional riders breeding thoroughbred for horse racing. 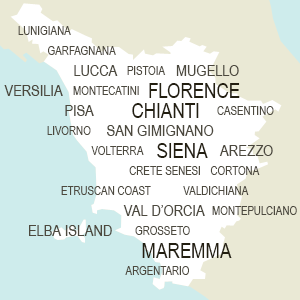 Close to Siena and to many other popular destinations of Tuscany, such as Val d'Orcia and Chianti area. Completely immersed in a 38 hectars park, the farmhouse is a corner of paradise for a vacation in contact with nature. La Selva farmhouse offers holiday accommodations for families, friends and groups. There are B&B rooms with ensuite bathroom, TV SAT and fridge. Guests can also find fully equipped self catering apartments for a totally independent holiday, provided with any modern amenity and outdoor space with table and chairs for enjoying open-air dinners. On request only, the B&B treatment is available for apartment guests also. Every accommodation is finely furnished and decorated with attention to the smallest detail for a unique vacation in this corner of paradise. Guests will have at their disposal a 38 hectars park for enjoying walks amidst nature or arranging trekking excursions on the relative paths. For those who prefer instead simply relaxing, the two-level garden is ideal for enjoying a good red wine glass, admiring the wonderful view while sitting in the garden or taking a refreshing dip in the outdoor pool. Breakfast is usually served on the terrace that looks onto the swimming pool: what a better way to wake-up than by greeting the wonders of the Siena countryside. La Selva breeds English thoroughbreds for horse racing, so guests will have the chance to see some marvellous examples of these animals. Last, but not least, there's also a little lake for fishing. Agriturismo La Selva is located at 5 kms only from Siena, totally surrounded by the green landscape but at a stone's throw from all shops and services guests may need. Val d'Orcia - and some of its most representative and beautiful towns like Pienza, Castiglione and San Quirico d'Orcia or Montalcino - is located close by, as well as other popular Tuscan destinations such as Chianti area, San Gimignano or Florence, easily reachable in less than an hour driving. This is the perfect location then for enjoying a spectacular holiday in the heart of Tuscany!